Following on the heels of last year’s event, the 2008 Barolo and White Truffle Charity Dinner, held on December 1, 2008, was another success. The dinner raised over $40,000 to benefit the Osteogenesis Imperfecta Foundation, an organization that supports medical research for this rare and debilitating brittle-bone disease. Because Osteogenesis Imperfecta is less well-known than other more common illnesses, researchers have difficulty attracting funding. I am especially grateful to the attendees for generously supporting a worthy cause, particularly in this challenging economic environment. 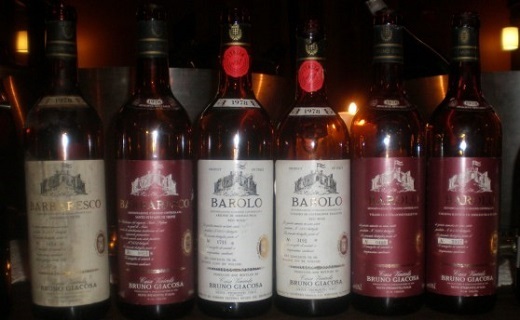 The theme this year was the 1978 Barolos and Barbarescos, among of the most legendary wines to come from Italy, or any region, for that matter. After a cool, miserable spring and early summer lowered yields, a blast of heat towards the end of the summer and into the fall produced some of the most intense, structured and concentrated Barolos and Barbarescos of all time. Incredibly, the wines have only recently begun to peak, so the timing seemed right for an in-depth look at a group of the most representative wines. A few Champagnes were sprinkled throughout to cleanse the palate. Del Posto proprietor Joe Bastianich and Wine Director Morgan Rich, along with their team, did a phenomenal job in coordinating this evening of food and wine. I have eaten at Del Posto many times, but this was the finest meal I recall ever having here. For the occasion Bastianch sourced a huge white truffle from Alba which we dutifully devoured over the course of the dinner. The wines were equally brilliant. I had purchased most of the Piedmont wines over the years from a collector and dear friend I consider to be the world’s greatest expert on the legendary traditional Barolos and Barbarescos. Many of the remaining wines had been acquired from the estates themselves. It is hard to imagine a more pristine collection of wines, and indeed almost all of these bottles were textbook-perfect examples that were truly a privilege to drink, particularly in this setting. Two jeroboams of Bollinger’s famed R.D. kicked off the evening in grand style. The big bottles were quite a sight, and both wines were simply beautiful. The 1981 was a very delicate, soft R.D., while the 1973 was noticeably more fresh and vibrant. The 1995 Dom Pérignon (2nd Release) Œenothèque was simply beautiful in its shimmering layers of perfumed, mineral-laced fruit. As we sat down two older but beautiful Dom Pérignons were served. The 1952 was sweet and sublime in its creamy notes of toffee, caramel and spices. The bubbles were mostly gone, yet this was an intriguing wine. The 1955 was a touch more advanced, with a similar flavor profile as the 1952, yet showed greater sweetness and richness in its texture. The 1962 Piper-Heidsieck Piper Pink was the unanimous favorite in this flight, as we were all taken aback by the wine’s vitality. Sweet, perfumed layers of passion fruit and roses were just some of the notes that emerged from this creamy, gorgeous Champagne. Gaja’s 1978 Barbaresco was a stunning wine with which to open our foray into the Barolos and Barbarescos of this historic vintage. The Pinot-like aromas alone were captivating, but the wine was even better on the palate, where silky tannins framed a gorgeous core of red fruit, flowers, licorice and tar. This was by far the best bottle of this wine I have ever had. The 1978 Barolo from Paolo Scavino was a last-minute substitute, and a wine I had never tasted. An early, classic Barolo from this now-famous property, the wine exhibited compelling balance in an ethereal, floral, style that was impressive. This delicate Barolo showed great length, along with pretty, mentholated notes that lingered on the finish. It was superb, which is saying something considering the other wines in this flight. The 1978 Cantina Mascarello Barolo was a wine I had looked forward to for some time, as I had purchased it directly at the estate some years back. Bottled in the traditional 1.9 liter magnum customary of that time, the wine showed a feminine, Burgundian core of fruit, with lovely inner sweetness and delicate notes of autumn leaves that lingered on the finish. Though fully mature, or close to it, the wine delivered immense pleasure. Aldo Conterno’s 1978 Barolo Riserva Granbussia was another ex-cellar magnum that was stratospheric. As one might reasonably expect from a Barolo that is mostly Monforte fruit, the wine revealed a deeper, richer tonality than the Mascarello, along with a well-articulated, vibrant aromas and flavors that recalled violets, black cherries, sweet spices and menthol. It was easily one of the greatest Granbussias I have ever tasted. This first flight was paired with a raw beef dish that paid homage to Piedmont’s traditional carne cruda, but with some modern touches and seasonings that worked beautifully. 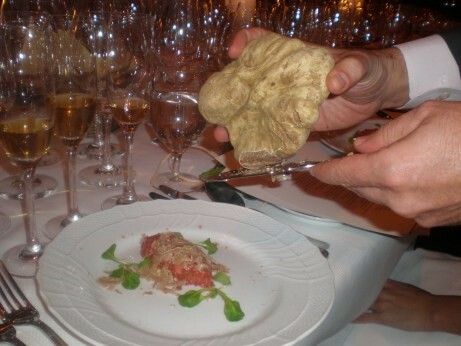 And a final, generous shaving of white truffles topped off the dish in style. We then moved into what was easily the most anticipated flight of the night, a staggering collection of wines from Bruno Giacosa in what is arguably his finest vintage, considering the number of monumental wines he made that year. Giacosa’s 1978 Barbaresco Gallina was pleasantly evolved but beautiful, especially for its smooth texture and an inner perfume of spices, tobacco and dark fruit that carried through to the long, polished finish. Somewhat ethereal in style, it was the perfect introductory wine. The 1978 Barbaresco Riserva Santo Stefano is one of Piedmont’s legendary wines and today is at a glorious peak. This fresh, vibrant Barbaresco showed tons of fruit that matched the wine’s structure blow by blow in an extraordinary display of elegance and class. This was my last bottle, I can’t think of a better occasion or group of people to have shared the wine with. The 1978 Barolo Villero (white label) was slightly forward and lean, especially when compared to the Red Label Riserva that would follow, but on its own it would have been incredible. The 1978 Barolo Arione showed the sinewy, muscular side to its personality, with pretty notes of mint that gave the wine a nice sense of lift on the finish. The 1978 Barolo Riserva Villero embodied all of the finest qualities of this great vineyard. Layers of dark fruit, and spiced, balsamic overtones seemed to never end in this utterly profound wine. Tasting the Riserva and non-Riserva Villeros was illuminating as the wines were clearly different, with the Riserva offering a significantly greater level of richness and sheer volume. Giacosa’s 1978 Barolo Riserva Collina Rionda was breathtaking in its seamless, generous fruit, which completely balanced the tannins. This remarkable Barolo offers up wonderful scents of roses, cherries, spices, leather and licorice in a stunning display of elegance married to power. It was a truly exceptional bottle. A magnum of Selosse’s 1998 Brut was pure magic. The rich fabric of smoke, candied apricots, spices and minerals was utterly seductive in this large-scaled, muscular wine. As great as the 1998 was, nothing could have prepared me for the extraordinary beauty of Selosse’s 1990 Brut. This wine approached perfection, with exceptional purity and precision in its fruit and spellbinding balance. The 1990 came across as more focused and less overtly sweet than the 1998. Both bottles were incredible, but the 1990 was otherworldly. The 1978 Barolo Villero from Giuseppe Mascarello was insanely beautiful. The Villero often takes a backseat to the Monprivato in this producer’s portfolio, but on this night the wine was firing on all cylinders, with an expressive bouquet and endless layers of fruit that continued to develop in the glass. It was fascinating to compare this Barolo with Bruno Giacosa’s versions from the same vineyard, as the wines all showed the deeply spiced, mentholated imprint of this site. As we moved on to the 1978 Monprivato it was clear, if anyone needed to be reminded, why this Barolo is one of the standouts of the vintage. The Monprivato revealed superb density and richness in its dark fruit, along with balsamic notes that danced on the palate with stunning grace. This was an utterly moving Barolo. Rocche dei Manzoni’s 1978 Barolo Valentino has long been one of the insiders’ wines of the vintage, and it was once again terrific, in a slightly more ethereal and advanced stage than some of the more vibrant wines of the night. Still it offered incredible balance and tons of harmony. 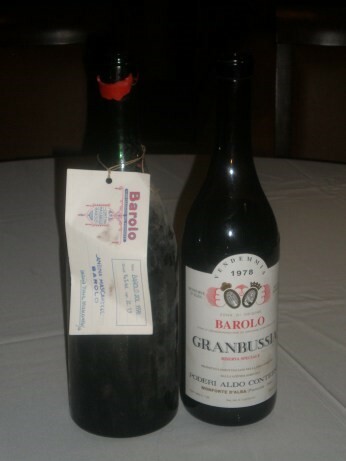 A bottle of the 1978 Borgogno Barolo (library release) was a late substitute for a corked bottle from Brovia. To be honest, I am not especially fond of these re-releases from Borgogno as they typically deliver very little vintage quality, but this was a perfectly decent bottle that was among the finest examples I have had. The Hen Tortellini in Brodo was finished at the table. This delicate and pure, yet incredibly flavorful dish was heavenly with these magical wines. The following flight grouped together a number of wines from the village of Serralunga. Pio Cesare’s 1978 Barolo offered great depth in its plums, menthol and minerals with remarkable purity and grace. This ex-cellar bottle was terrific. In 1978 the estate made just one Barolo, and much of the fruit for this wine came from the Ornato vineyard that today is the source of the estate’s top bottling. Cappellano’s 1978 Barolo was one of the highlights of the night. I remember paying an absurdly low amount for this wine a few years back. All of the bottles have been superb, but this one, my last, was phenomenal. The wine flowed with masses of dark, primary fruit that completely obscured the tannins, creating a sensation of roundness that was breathtaking. This incredibly pure, harmonious Barolo was monumental. Ceretto’s 1978 Barolo Bricco Rocche Prapò can be outstanding, but this bottle was not among the finest I have had. That was quickly forgotten once Giacomo Conterno’s 1978 Barolo Riserva Monfortino appeared. The 1978 Monfortino is widely regarded as one of the pinnacles of Barolo and this bottle did not disappoint. Many of the top wines in this vintage possess incredible richness of fruit. 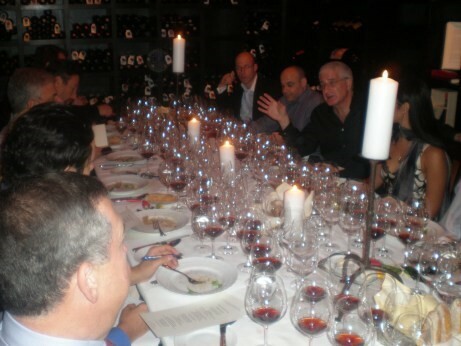 The Monfortino added a further dimension of clarity and precision that elevated it among this group of heroic wines. This bottle was pure magic, as layers of deeply spiced fruit flowed with remarkable precision, power and sheer elegance. Del Posto’s Robiola Caramelle were delicious. This imaginative pasta dish was a playful take on the wrapped Italian hard candies, with the cheese as the filling. The first main course of Dover Sole and Tuber Sauce was paired with an exquisite trio of Champagnes. Unfortunately the 1973 Dom Pérignon Œenothèque (2nd release) was corked, which was doubly sad as the wine was otherwise quite fresh and beautifully intact. The 1973 Moët & Chandon Dom Pérignon (magnum, original release) was generous and expansive in its sweet spices, apricots and roasted nuts. The estate’s 1975 Dom Pérignon Œenothèque (3rd release) was pure magic, as it has always been. A vibrant and incredibly pure Champagne, the wine revealed layers of smoke, minerals and ripe fruit with superb richness, clarity and focus. This was a monumental bottle of one of my favorite Champagnes. The Veal Chop with Cardoons and Fonduta was one the highlights of the meal, in fact, this may be the finest dish I have ever eaten at Del Posto. Cut from a gorgeous whole-roasted rack, my chop was cooked perfectly, but I was only able to enjoy the color of the meat for an instant before it was completely covered with truffles. The veal was a culinary tour-de-force. Some of the highlights in our last flight included a spectacular bottle of Brezza’s 1978 Barolo Riserva Speciale, which was packed with fruit. In 1978 Brezza still made just one Barolo, a blend from various vineyards. Today it is impossible not to remain impressed with the finest multi-village wines of this era. I also loved the 1978 Barolo Brunate from Marcarini for its layers of sweet, perfumed fruit and overall accessible personality. Cordero di Montezemolo’s 1978 Barolo enjoyed a strong showing in the floral style that is typical of the wines of La Morra. Sadly, Giuseppe Rinaldi’s 1978 Barolo was flawed. It was my first time tasting the multi-vineyard Barolo (not the Brunate) the estate made that year, and I suppose I will have to wait for another opportunity to assess whether or not this was a representative bottle. 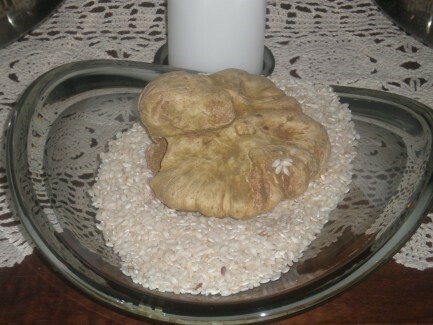 The truffle theme continued into dessert. A delicious home-made gelato was topped with truffles and served alongside a chocolate sauce, an odd combination that strangely worked far better than I would have expected. For fun, I brought along a bottle of the 1978 Château Rieussec. This was by no means a profound Rieussec, but it was fully mature and offered a nice counterpoint to the dessert and the homemade cookies that were served at the end of the meal. As we departed I could only think how fortunate we were to have enjoyed this unforgettable evening of great wine, food and friendship. The only thing left was to contemplate how we might equal or top this event next year. Perhaps a survey of wines from Piedmont’s legendary 1971, 1978, 1982, 1985 and 1989 vintages might do the trick….